COLORADO SPRINGS, March 31, 2008 - Jiffy Lube presented Lyn Hughes from the American Heart Association with a $1 million check benefiting the _Go Red For Women™ _movement at the Jiffy Lube International 2008 Convention and Trade Show. More than 1,750 Jiffy Lube service centers participated in the Jiffy Lube Maintenance Partners for Life campaign, which raised awareness and funds for heart disease prevention. The two-month program ends March 31. Jiffy Lube Maintenance Partners for Life leverages the strong parallels between properly maintaining both heart health and vehicle health, and educates people on smart preventive maintenance for their bodies and vehicles. The campaign is the first-ever Jiffy Lube national cause campaign. One hundred percent of the funds raised will benefit the local communities in which they are raised, and these funds will contribute to the fight against heart disease -- the number one killer of women and men in the United States. "The generous support of our customers and the passion of our franchisees and their employees made it possible for us to present this check today to the American Heart Association," said Lisa Carlson, global director of marketing for Jiffy Lube International. "Together, we've succeeded in meeting our fundraising goal, and we're honored that we can contribute to important research and development toward wiping out this deadly disease." The campaign raised funds through Maintenance Partners for Life savings books, which were given to customers in appreciation for a $3 donation to Go Red For Women . Many service centers raised additional funds by hosting local events and visiting local businesses in their communities. "This is the first time ever in the 80 years of the American Heart Association's history that a corporate partner has raised $1 million in the first year," said Lyn Hughes, vice president of national corporate relations for the American Heart Association . "We extend our deepest thanks to Jiffy Lube for this phenomenal achievement. The Maintenance Partners for Life campaign clearly made a distinct connection with consumers, and the efforts of Jiffy Lube help fight heart disease in our local communities where we all work, play, and raise families." To find your local Jiffy Lube location, visit Locations.JiffyLube.com. Since 2004, Go Red For Women has captured the energy, passion, and intelligence of women to work collectively to wipe out heart disease - the No. 1 killer of women. Today, we want millions of women across America to take heart disease personally. Using the simple platform "Love Your Heart," Go Red For Women engages these women - and the men who love them - to embrace the cause. Healthcare providers, celebrities, and politicians also elevate the cause and spread the word about women and heart disease. For more information about Go Red For Women, please call 1-888-MY-HEART (1-888-694-3278) or visit GoRedForWomen.org. 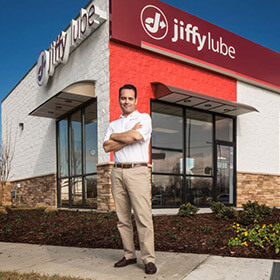 Jiffy Lube, with more than 2,200 service centers in North America, serves approximately 27.5 million customers each year. Jiffy Lube pioneered the fast oil change industry in 1979 by establishing the first drive-through service bay, providing customers with fast, professional service for their vehicles. Headquartered in Houston, Jiffy Lube International is a wholly owned, indirect subsidiary of Shell Oil Company. Visit www.JiffyLube.com to learn more about Jiffy Lube and vehicle care.